Size: 10.4" x 8.5" x 2.4"
The TI-5660 includes every feature you expect from a high-end office printer. It is capable of a two-colored printing on normal paper like the earlier TI-5162. The otherwise identical TI-5630 prints only in black color. The UL-File number E202867 of the calculator reveals it as a product manufactured by INVENTEC APPLIANCES (SHANGHAI) CO LTD. 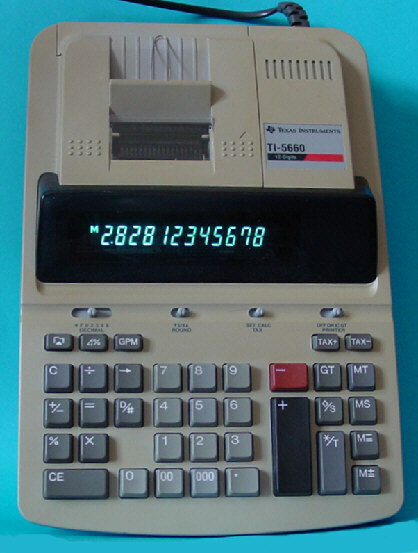 The TI-5660 is featured in the Texas Instruments Incorporated sales catalog CL-1233 dated 1994.